High-end entertainment is Anaheim’s current history. Visitors from around the world travel to enjoy this unique tourist destination. Anaheim offers extensive family entertainment including Disneyland, Disney’s California Adventure, Angel’s baseball, Mighty Ducks hockey, Disney Ice and the Anaheim Garden Walk. The city offers many options for housing, as Anaheim has diverse neighborhoods and wide range pricing throughout the city. Affordable-housing apartment units are available citywide. The Promenade in Downtown offers lofts, million dollar estates of Peralta and Anaheim Hills to family neighborhoods illustrate many of the Anaheim homes. The community-oriented farmers’ market is one of the best in the county. Located in Downtown, venders sell fresh produce, baked goods, handmade crafts, and original art every Thursday afternoon. There are seven school districts in the city – Anaheim City, Savanna, Centralia, Magnolia, Placentia-Yorba Linda Unified, Orange Unified and Anaheim Union High School. For the Catholic community the city has religiously based educations at Servite, an all boys school, and Connelly High, an all girls school. North Orange County Real Estate agents can answer all your important school questions. Forty-seven neighborhood parks surround the Anaheim Real Estate for residents to enjoy. For the more adventurous recreational seeker the city offers two skate parks. Two golf courses, Dad Miller and Anaheim Hills, are perfect for the avid golfer. Adjacent to the Anaheim Hills course sits Oak Canyon Nature Center, a great place for hiking. The Santa Ana riverbed supplies bike and walking trails. The riverbed trails run from Riverside county border to the beaches of Orange County. It's accessible by all residents in Anaheim Real Estate. For commuters, the city has one of the few transit hubs. The Metrolink, located near the Angels Stadium, connects San Diego to Los Angeles and a Greyhound station is available for bus travelers. 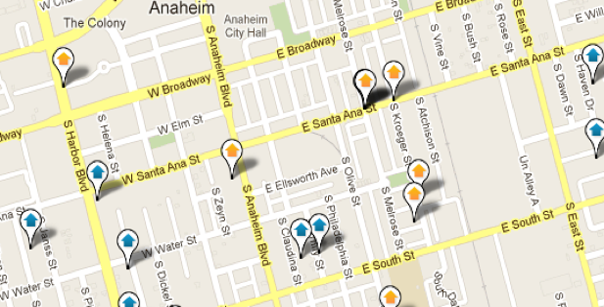 Interested in Anaheim homes for sale or Anaheim Condos for sale? Contact one of our North Orange County Real Estate agents. Our agents will personally show you this exciting city and answer all your questions about Anaheim homes and Anaheim condos.